Hedges act as natural barriers in a garden. They can block the wind and keep your garden protected from soil and plant erosion. They can define spaces within a design, provide privacy around pools or play areas, or create a barrier around your property lines and entrances. While not the only option for creating hedges, these are popular due to their hardy, disease-resistant natures and comparative ease of pruning. What’s below where you want to dig – contact ‘dial before you dig’ it’s a free service. 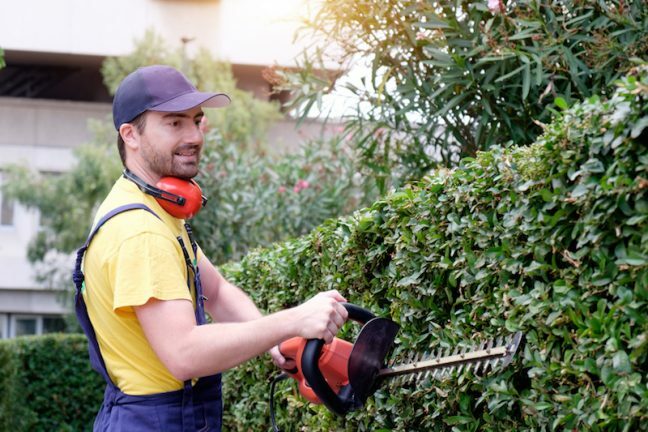 Proper hedge maintenance is important to keep these natural barriers intact, healthy and from taking over the other plants and space in your garden. Hedge maintenance doesn’t have to be difficult or expensive. In fact, consistent maintenance can pay off in the future. With proper maintenance and attention, hedges can be trained to grow and develop in a certain way. The plant “learns” how to grow in a way that is healthy for itself. This means not needing to maintain the plant as much in the long-run. New hedges should always be carefully maintained from the beginning to help it establish the shape you want.. Begin at one end, keeping the shears level and regularly checking at eye-level to assess the even-ness of the cuts. If you don’t trust your eyes to give you a straight line, use a length of string pulled taunt to set the lines before you cut. The season and regularity of trimming depends on the species but try to not cut too early in the year to avoid disturb any birds which might be nesting in your hedge. Most times you can get away with between 3-4 times a year, but, especially if you are trying to maintain a specific shape, you will be able to tell! Try to avoid trimming on very hot or windy days – not just for safeties sake, new foliage can burn in hot sunlight. Hedges play an important role in gardens and landscapes, and can add a lot to the overall style and theme of your garden design. Considering hedges are used for outdoor mazes, their role in creating an organized look shouldn’t be ignored. These plants are an effective and affordable way to turn your outdoor areas into organized, livable spaces. Hedges are beneficial for wildlife, which in turn, can help you out as well. Wild creatures use hedges for a variety of reasons, many of which will provide a home for potential pests and keep them out of your garden. Hedgerows are nature’s highways. Since most small animals avoid large, open spaces, they will use hedgerows to get from one point to another. You can use hedges to keep these small animals out of your garden or landscape. They will be less likely to harm the other plants and trees and may avoid your garden altogether. If you plan on looking after them yourself, make sure you invest in the proper tools and be aware that higher hedges can be precarious and possibly dangerous to trim. 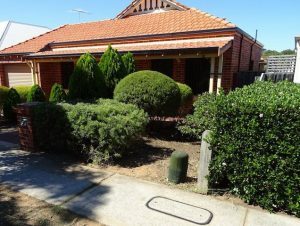 The easy and safe way is to hire a professional gardener who will have the right tools, experience and insurance for handling the tough jobs for you, so it’s worth outsourcing the maintenance and maybe just doing touch ups yourself in between visits. They will also be able to remove all the green waste as an added bonus. 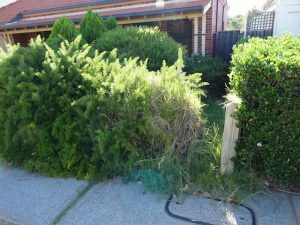 The key is consistency, both to maintain the looks and health of your hedge, and prevent damage to surrounding plants and hardscaping like fences – once they are out of control it becomes a much harder job.